Claire Pearce, Project Manager, directly. Ramer Ltd have been manufacturing pva sponges in the UK for over 70 years, using their proprietary Ramerfoam® Technology for applications including personal and super-soft baby care (fig. 1) and a wide-range of specialist grades. Still a family-owned & run business, they’re based in Devon, supplying products around the globe. Ramer are keen to further develop their sponge grades for technical applications where their physical properties are desired. Understanding the physical structure of their material, in comparison with competing alternatives, would help the targeting of applications in new markets. It was agreed that Plymouth Electron Microscopy Centre (PEMC) would analyse three samples (two Ramerfoam® grades, and a competitor grade). 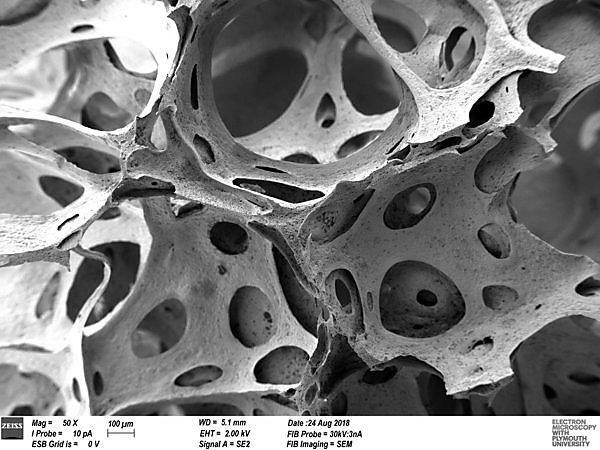 Along with a general comparison of pore structures, cross sections would also be created using the FIB-SEM, to study the material structure between the pores. 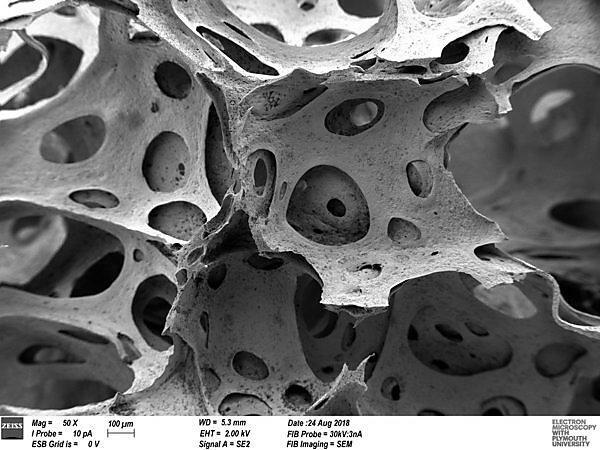 Initial observations of high & low density Ramerfoam® sponges showed that the microstructures were visually similar. Both exhibited similar surface features; similar cross-sections (sections created on the cell wall material between the pores); and similar pore structures. The competitor’s sponge sample showed a lower consistency of pore sizes, and a higher density of pores. However, the biggest difference was in the cell wall structure: the Ramerfoam® material had a more uniform and a denser cell wall in comparison with the competitor sample, which had a high number of tendril-like features, and a more open cell wall structure. This would help explain the higher measured water-holding capacity of Ramerfoam® over competitor’s materials. "We have observed that Ramerfoam® exhibits a very high capacity for holding water within its cell walls, and has excellent non-particulating properties. This analysis provides evidence to explain why and how this is achieved, and how we can exploit these advantages to specifically target Ramerfoam® grades for additional technical applications."